The Advanced Combat Helmet (ACH) is the United States Army's current combat helmet, used since the mid-2000s. 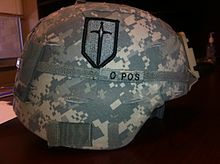 It was developed by the United States Army Soldier Systems Center, the U.S. Army Special Operations Command, and the U.S. Army Research Laboratory to be the next generation of protective combat helmets for use by the U.S. Army. 2013 video by the U.S. Army, showcasing the ACH's protective capabilities. The ACH is derived from the Modular Integrated Communications Helmet. The ACH is currently in the process of being phased out and replaced by the Enhanced Combat Helmet (ECH), an improvement upon the ACH derived from its design. A 4th Infantry Division soldier wearing an ACH helmet in the MultiCam pattern. The Advanced Combat Helmet was first fielded beginning in 2002[N 1] in limited numbers to eventually replace the PASGT helmet. In 2007 the Army introduced a ballistic "nape pad" that attaches to the ACH's rear suspension system. 430,000 were to be issued in the Rapid Fielding Initiative (RFI). In 2006, 102,000 helmets were ordered from ArmorSource, of which 99,000 were delivered when the contract was fulfilled and properly closed. Beginning in 2008, the Army's Program Executive Office Soldier outfitted soldiers of the 101st Airborne Division and 4th Infantry Division bound for Iraq with helmet-mounted sensors designed to gather data on head injuries (or traumatic brain injuries) caused during Improvised Explosive Device (IED) detonations. The data collected will help with the design of improvements to the MICH's suspension and chin strap systems. In May 2009, 55,000 of these were in storage and 44,000 were in use U.S. Army, Navy, and Air Force personnel. The 44,000 helmets in use by service members were recalled by the U.S. Army in May 2010 due to potentially defective materials being used. No proof of defective materials was ever established nor evidence of any wrongdoing by the contractor. In May 2009, 34,218 ACHs made by the Gentex Corporation were recalled. Certain screws attaching the chinstrap and other parts to the helmet did not conform to specifications in the contract. The screws failed ballistics tests at extreme temperatures. Gentex alleges its subcontractor had fabricated compliance certificates for the screws. A MultiCam cover for the Advanced Combat Helmet began fielding in late 2009 for soldiers deployed in Afghanistan. On March 7, 2016, Armorsource LLC agreed to pay $3 million to settle False Claims Act allegations. Revision was awarded a contract for the ACH II contract. The ACH and Lightweight Helmets will eventually be replaced by the Enhanced Combat Helmet. The shape of the ACH is virtually identical to the MICH TC-2000. Compared to the PASGT helmet, the front brow is eliminated to improve upwards visibility and allow easier mounting of night-vision goggle brackets. The side brim has been raised to the point that the entire lower brim of the helmet is "flat" compared to the PASGT which curves upwards at the back. This is to allow greater compatibility with communications headsets and improve hearing when headsets are not used. In 2007 the Army developed and introduced a ballistic "nape pad" that attaches to the ACH's rear suspension system and coincided with the introduction of the Improved Outer Tactical Vest (IOTV). The pad reduces soldier deaths from shrapnel wounds to the neck and lower head. The Generation II Lightweight Advanced Combat Helmet, or LW ACH, weighs one pound less than the original ACH while offering the same ballistic protection. Iraq: Used by Iraqi commandos. Israel: In use by YAMAM. Macedonia: ACH helmets made by Eurokompozit used by the Macedonian Police's Special Task Unit "Tigers". New Zealand: ACH helmets made by Rabintex used by the New Zealand Defense Forces. United States: Used by the U.S. Army. ^ Some sources report that the helmet was first fielded in 2003. ^ a b "Advanced Combat Helmet ( ACH )". Archived from the original on 16 March 2007. Retrieved 2007-03-22. ^ Boyd, Ryan. "Advanced Combat Helmet - ACH". Military.com. Retrieved 2018-08-17. ^ Anderson, David (April 20, 2016). "Soldier visits Aberdeen Proving Ground labs where helmet that saved his life was developed". The Baltimore Sun. Retrieved 2018-08-17. ^ Veterans, Hard Head. "Ballistic Military Helmets and Which One is Right for You!". ^ a b "Advanced Combat Helmet ACH". ^ "Helmet Sensors, Improved Armor Helping Soldier Survivability". ^ C. Todd Lopez (12 August 2010). "New uniform for OEF protects Soldiers, hides them better". Archived from the original on February 4, 2011. Retrieved 31 January 2011. Gear being fielded to Soldiers with the new pattern includes a cover for the Advanced Combat Helmet, the Extended Cold Weather Clothing System, the Fire Resistant Army Combat Uniform, the Improved Outer Tactical Vest, both the sun hat and patrol cap, name and service tapes for the FR ACU, and multiple pieces of Modular Lightweight Load-carrying Equipment. ^ "Defense Contractor Armorsource LLC Agrees to Pay $3 Million to Settle False Claims Act Allegations". www.justice.gov. ^ Matthew Cox; Dan Lamothe (31 August 2009). 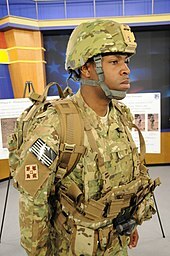 "Army's new plastic helmet tops Kevlar ACH". Gannett Government Media Corporation. Retrieved 31 January 2011. ^ Matthew Cox (28 February 2007). "New helmet pad protects from fragments". Gannett Government Media Corporation. Retrieved 31 January 2011. ^ "Specijalne-jedinice.com - Special Task Unit "Tiger" of the Republic Macedonia". specijalne-jedinice.com. Wikimedia Commons has media related to Advanced Combat Helmet.